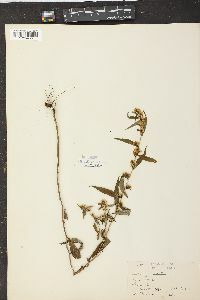 Plants (20-)35-80(-100) cm; rhizomes woody, caudexlike. 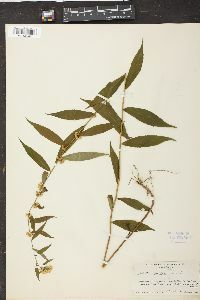 Stems 1-10+, usually blue to purple, glaucous, arching, straight , usually simple, occasionally with 2-3(-4) elongated lateral branches, glabrous or slightly strigose in arrays. 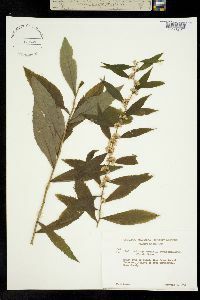 Leaves: basal withering by flowering; proximal to mid cauline sessile, blades lanceolate, (47-)70-100(-150) × 8-20(-30) mm, margins serrate (with 0-24 teeth per side), apices acuminate, faces abaxially glabrous or sparsely hairy, adaxially sparsely hairy; distal sessile, blades narrowly lanceolate, (20-)40-70(-100) × (3.4-)5.6-11(-17) mm, margins entire to slightly serrate, faces glabrous or sparsely hairy. Heads 9-380, in short, secund, axillary and terminal racemo-paniculiform clusters (4.4-)13-36(-58) cm. Peduncles 2-10 mm, sparsely to moderately strigose; bracteoles linear, 1-8. Involucres narrowly campanulate, (3.5-)4.8-6(-7.2) mm. Phyllaries in ca. 3 series, unequal, outermost lanceolate (1-1.7 mm), acute, innermost linear-oblong (2.3-4 mm), 1-nerved, obtuse to acute. Ray florets 1-6; laminae (1.5-)2-3(-4) × ca. 1 mm. Disc florets 3-6(-9); corollas 2-3(-4) mm, lobes (0.5-)1-1.5(-2) mm. 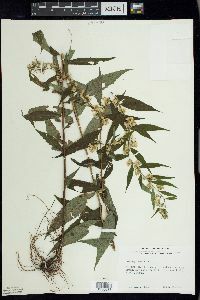 Cypselae 1-2(-2.5) mm, moderately to densely strigose; pappi 2-3(-3.7) mm. 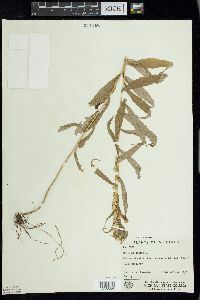 Solidago caesia is sometimes defined more broadly to include the erect-stemmed S. curtisii and S. ouachitensis. Plants 3-10 dm from a short, stout, caudex-like rhizome, sometimes with long, creeping rhizomes as well; stem terete, glaucous; lvs chiefly cauline, ±serrate, acuminate, glabrous or slightly hairy, lanceolate or lance-elliptic, 6-12 נ1-3 cm, 3-10 times as long as wide, tapering to the sessile or obscurely short-petiolate base; infl chiefly axillary (sometimes branched) as in no. 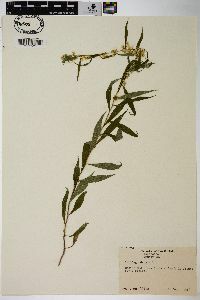 19 [Solidago curtisii Torr. & A. 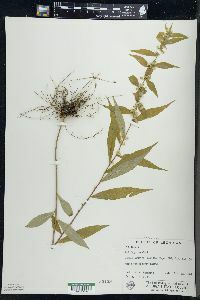 Gray]; invol glabrous, 3-4.5 mm, its bracts narrow, obtuse or rounded, tending to be obscurely several-nerved; rays (1-)3-4(-5); disk-fls 5-8; achenes hairy; 2n=18. Woods; N.S. and s. Que. to Wis., s. to Fla. and Tex. An apparent hybrid with no. 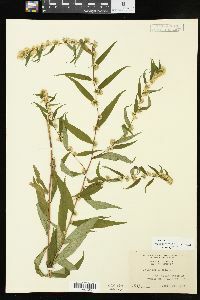 30 [Solidago ulmifolia Muhl.] 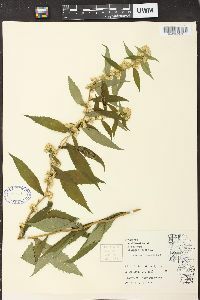 is S. صlmicaesia Friesner.